Organic Seed Market size was more than USD 1.6 billion in 2015 and will witness gains at over 12.5% CAGR from 2016 to 2024. Increasing natural food demand and rising awareness among consumers regarding health benefits from non-synthetic food will drive the organic seeds market growth. Growing food & beverage business due to change in consumer buying behaviour, particularly in India, China, Indonesia, and Malaysia. Rising awareness towards non-chemical farming owing to environmental concerns will positively favour organic seed market size over the forecast timeframe. Favorable government norms which support chemical free farming while producing these seeds may propel industry growth. Organic food products provide better nutritional value, taste, and higher antioxidants properties. These products will not utilize harmful chemical pesticides, herbicides, fertilizers, and insecticides during their production which will drive the overall market share from 2016 to 2024. Governments, organizations, and agencies in various countries have taken initiatives to encourage non-synthetic crop production. Increasing awareness among consumers about health benefits related to the non-synthetic food consumption will positively influence organic seeds market growth. Organic seed industry price trend is higher as compared to synthetic counterparts, which will positively impact the product penetration in developing countries. Also, lack of awareness among consumers and the demand-supply gap will inhibit the industry growth potential. Technological advancements and better functional supply chain will provide growth opportunities to various industry participants. Government contribution in helping consumer’s understandability about false & legitimate products will fuel the overall market growth. Vegetable led the organic seed market and will account for over 33% of the industry revenue by 2024. High nutritional levels, easy digestion, better taste, and higher anti-oxidant properties are main characteristics that encourage industry growth in vegetables including leafy & cruciferous and gourd & root. Crop seeds market size may witness significant gains at over 11% up to 2024. China, Japan, India, and Indonesia are the major organic crop seed producing countries. It includes the production of rice, corn, barley, oats, rye, and alfalfa. Increasing awareness among consumers regarding food benefits and higher product availability, particularly in these regions would impact the industry growth positively. Also, increasing local farm cooperatives and producers would increase the product availability resulting in a higher market penetration. Supportive schemes and programs from different regional governments and organizations should drive the market growth. Shift in consumer preference from chemicals and genetically modified crops to naturally sourced products may propel industry growth demand. Germany organic seeds market from fruits & nuts were valued at over USD 35 million in 2015. Growing awareness about the health issues and an increase fruits & nuts consumption should drive industry growth. Organic seed market is distributed through various channels including wholesalers, retailers, and cooperatives. Farmers use direct marketing through single or multiple channels. The type of distribution channel generally depends on the size of farms, country’s infrastructural growth, and on food and supply chain regulation policies and guidelines. Organic seed Indutry size through wholesaler accounted for more than 60% industry share in 2015. Wholesalers buy these seeds from farmers in huge quantities, store in warehouses, and resell them to retailers. Governmental intervention in supply chain system should encourage market demand size. 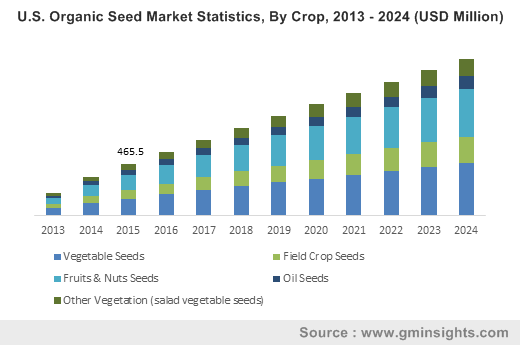 North America, led by the U.S. organic seed market, is foreseen to witness gains at over 12% up to 2024. With advancements in biotechnology providing better environmental friendly solutions to farmers will support the industry growth. APAC, dominated by China and India market, generated over USD 400 million in 2015. Rise in disposable income, increasing health awareness, and favorable government regulatory norms should drive product market size. Governments and agricultural agencies have taken numerous initiatives such as educating farmers, favorable policies, loan initiatives, and tax incentives to boost natural farming. These initiatives along with growing awareness among consumers regarding food benefits are projected to support regional industry growth. Europe market, led by Germany, France, UK, and Italy, will generate over USD 940 million business from wholesale segment. Advanced farming technology, along with governments’ supportive norms promoting industry growth. Better supply chain and growing consumer preferences regarding the non-synthetic food and beverages will fuel organic seeds market growth in this region. Global organic seed industry share is highly competitive in nature due to the presence of numerous regional and local manufacturers. Johnny’s Selected, Southern Exposure Seed Exchange, Fedco, Seed Saver Exchange, Wild Garden, Farm Direct, Rijk Zwaan, De Bolster, Navdanya, Fleuren, HILD Samen, Vitalis, and High Mowing are key industry players. Other notable manufacturers are Mass Plant, Wild Garden Seed, Territorial Company, Fleuren, Arnica Kwekerij, Baker Creek Heirloom, Renee’s Garden, and Kusa Seed Society. The market participants experience a product supply shortage, thus failing to fulfill consumer demand. This leads to the low bargaining power among buyers and high bargaining power among the suppliers. The market also faces threats from new participants due to its high scope of development in unexplored regions of Asia Pacific, Latin America, and Africa. Organic seeds are produced by farmers, which exclude the use of insecticides, pesticides, chemical fertilizers, and any other use of chemicals in the field, harvesting, and processing it. It is also grown using sustainable agricultural methods, which provide more benefits to producers. Companies involved in non-chemical farming type must conform to standards regulated by USDA NOP. The NOP develops rules & regulations regarding production, handling, labeling, and implementation of USDA based products. This rulemaking needs input from the National Organic Standards Board (NOS) and public. The NOP also maintains a reference manual, which includes guidance, instructions, documents, and policy memo relating to prescribed standards. This type of farming is carried on in over 160 countries and holds about 1% of the total arable land. In Europe, the source of seed production needs to be listed on the EU common catalogues of varieties. The product then need to fulfill conventional regulations on quality including no weed and additional certification is required finally to market the products. Organic Materials Review Institute (OMRI) consists of a database for certified products with a goal to provide a common platform to find stock supplies. This site can be used in free terms by public searching by variety or crop or company type. Industry players should register with OMRI for database inclusion.